Most experts agree that soccer is the most watched and played sport on the planet. Somewhere out there right now there is a wannabe David Beckham, Pele, or Mia Hamm in the making. As they advance in the game, they are realizing that the mind is as useful a tool as the feet and the head. These affirmations are written to encourage and inspire your greatness as a soccer player whatever your level. Please feel free to substitute football or soccer, whichever term works for you. We are a great soccer team! We are a championship soccer team! We are a team of destiny! 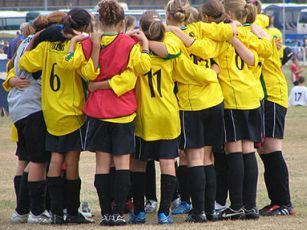 When we come together as a team, everything becomes possible for our soccer team! I am a great soccer player! I am a great soccer player! I am a great soccer player and I get better and better each and every day! I defeat my opponent in my mind and then I defeat him/her on the soccer field. I always outplay my opponent by out-thinking my opponent. When I face superior skills on the soccer field, I win with the superior determination! When I have superior skills on the soccer field, I win by maintaining my focus and executing! I am one part amazing soccer skills! I am one part of amazing mental skills! I am all parts a champion! Soccer is easy! Soccer is fun! Soccer is easy and fun for me! I am good soccer player on my way to being a great soccer player! I am a great soccer player and I am ready to be world-class! A world-class soccer player lives within me! Today I AM that player during my match! When I take the field, I channel my emotions into amazing soccer plays! I am a great soccer player. When my team needs a lift, I am always there to provide it! I love soccer and it shows in the way I play every match! I am a great goalkeeper! When the game is on the line, I always make the save! I am a great goalkeeper! I thrive on the one-to-one of a penalty kick! Bring it! I am a great goalkeeper! The net and me are one! I am a great goalkeeper! I am the leader of my defense! A great goalkeeper lives within me! Today that goalkeeper shows up in the net! I am a great scorer! When I’m on my A-game, I am unstoppable! I am a great scorer! One on one I am better than any goalie! I am a great scorer! My kicks are always powerful and accurate! I am a great scorer! I am always working my way into scoring position. I am a great scorer! I know where I am going with the ball before I get it! I am a great scorer! I know the goalie’s tendencies and I use them against him/her! I am a great scorer! When my teammates shoot, I always follow the shot! I am a great scorer! I know when to use power and when to use finesse! I am a great scorer! Both of my feet are dangerous scoring weapons. A great scorer lives within me! Today that scorer shows up as balls in the net! I am the best striker on my team! When the game is on the line, I want to take the shot! I am a great striker! When I get in scoring position, I finish! I refuse to dwell on bad plays! I am always focused on the next good play! I am a great passer! I put my teammates in a easy scoring situations! I work hard on my dribbling skills! They make a real difference in my game! I am a play maker! I am a great play maker! I am a difference-making play maker! A great forward lives within me! Today that forward shows up on the soccer field! I am a great forward! I get my shots and I make my shots! I am a great forward! When I miss a shot, I am already focused on making the next one. I am a great forward! I am all about scoring goals! I am happy scoring goals or getting assists! I am a great defender! My job is to shutdown the best scorer and that is what I do! I am a great defender! I perfect my tackling skills and stop scoring opportunities before they start! A great defender lives within me! Today that defender shows up on the soccer field! I am a great midfielder! I win with speed, strength, and smarts! A great midfielder lives within me! Today that midfielder shows up on the soccer field. If I have missed a particular skill or soccer topic that you would like an affirmation for, please leave a comment and I will update this list.